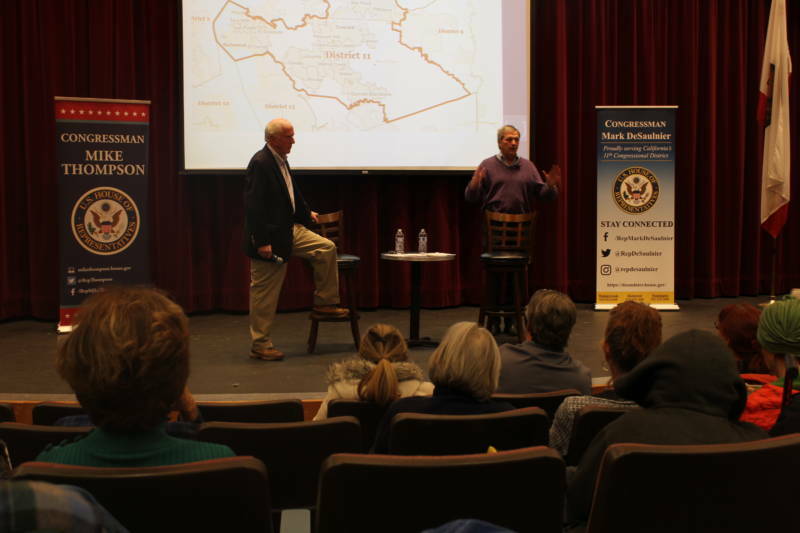 Reps. Mike Thompson, D-Helena, and Mark DeSaulnier, D-Concord, were in the Bay Area on Saturday talking with their constituents about a bipartisan bill that would expand background checks for most gun sales across the nation. Thompson, who is the lead author on H.R. 8, joined DeSaulnier for a town hall in Martinez on Saturday. A majority of Americans support the idea of background checks for firearm sales, and DeSaulnier said Saturday that it's finally gaining momentum with a new Democratic majority in the House. "We just had the first hearing in eight years on a gun bill in the United States House of Representatives," DeSaulnier said. With more than 200 co-authors, including a handful of Republicans, Thompson said he's confident that his bill will pass through the House Judiciary Committee next week and out of the House, but its fate in the Senate is uncertain. Even at the town hall meeting with the local crowd, he spent time answering to a small but vocal smattering of critics, some of whom spoke out in support of the National Rifle Association, which opposes the measure, and submitted written questions asking why the lawmakers were trying to take away their rights. "Here's the deal, nobody's trying to take away your God-given rights or your gun. Pass a background check and you have a gun, it's pretty simple," Thompson explained to applause. Dublin gun dealer Mike Grant said California has been doing background checks for years, and he supports them. He said without background checks, guns could end up in the hands of people who shouldn't have them. And should that person commit a crime he said, "it just makes the gun dealers, all of us, take more heat." While his small business has only had to turn down a couple of sales because of a bad record since the early 2000s, Grant said the same sort of precautions at larger, high-volume shops could have a big impact because they'll be able to screen more people and prevent guns from going to the wrong people. As a populous state, California has a high number of mass shooting deaths, but one of the nation’s lowest overall gun deaths per capita. Grant said he'd like to see the nation go even further by adopting more of the state's strict gun control laws, including lifetime bans for some people who commit domestic violence or exhibit mental illness. But Martinez resident Jency James favors H.R. 8's more measured approach because she think it has a better chance of getting bipartisan support. "It won't solve all the problems obviously, but it's a good first step, and I feel like we've had a lot of trouble getting to that first step. So I'm hopeful we can get anything done at this point," said James. Next week's expected vote coincides with the Thursday's anniversary of the Parkland school shooting in Florida.